Cowley College was recently approved by the Kansas Board of Regents to receive a Perkins State Leadership Grant in the amount of $39,425. The grant will be to work with subject matter experts in criminal justice, allied health, automotive, and other technical programs, along with a math expert, to develop contextualized curriculum using the competencies of College Algebra. 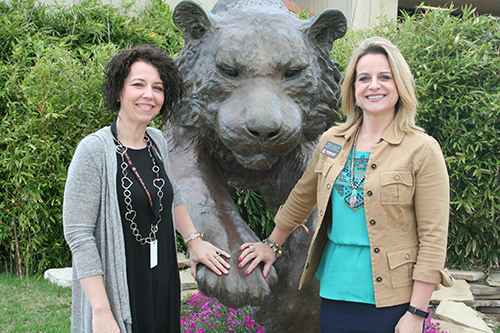 Cowley College math instructor Brooke Istas and associate vice president of business and industry advancement, Stephani Johns-Hines, developed the concept into a proposal. According to Istas, Washington (WA) State Board for Community and Technical Colleges developed the i-BEST model for Adult Basic Education, a model which has seen much success. Cowley’s intended grant project was developed with that model in mind. Along with the development of the curriculum – Cowley will develop professional development so that other instructors can implement the model in their courses as well. Johns-Hines said the purpose of the grant is to focus on integration of academic and career technical education programs, and developing and implementing strategies which result in increased completion of degree and certificate programs. Dr. Harold Arnett, Cowley College vice president of academic affairs, is proud of the work done by Istas and Johns-Hines.